Campsfield House Immigration Removal Centre opened 25 years ago this month. In this second part of a two-part blog, a campaigner from Campaign to Close Campsfield looks back at the local history of resistance. On 25 November 1993, the first people were brought from Harmondsworth (near Heathrow airport) to Camspfield detention centre. Twelve demonstrators met the two minibuses at Campsfield main gates and demanded their freedom. 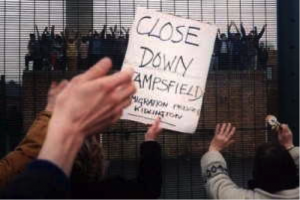 Almost at once there were individual and collective protests by those held inside Campsfield, including signed statements to the authorities, and mass hunger strikes, and these have continued for 25 years. Outside, there have been around 300 monthly demonstrations (last Saturday of the month at noon) and monthly public meetings in Oxford’s Town Hall (first Tuesday of the month at 7.30pm). Protests by those inside are supported on the first day of the month at 6pm by a vigil at the centre. 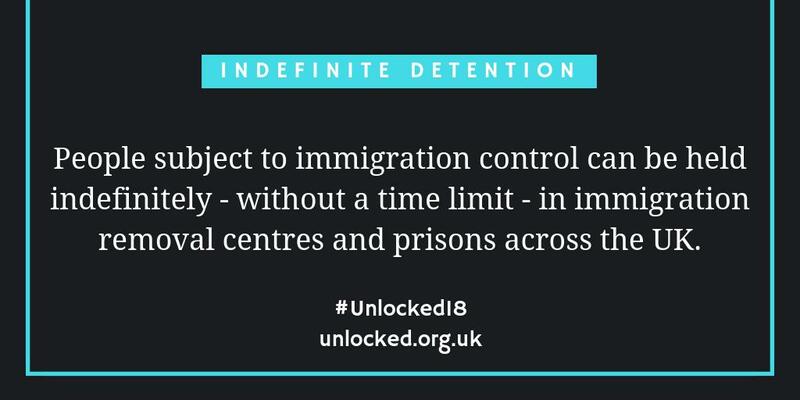 The strategy of the supporting Campaign has been to create awareness and publicity, locally and nationally, and to raise support for the demand to end immigration detention, in the local community and nationally. Monthly demonstrations, public meetings, publicity events and leafleting on specific issues. Providing speakers for interested organisations, 6th forms etc. Supporting university student anti-detention activities. Speaking up in the media – local radio, TV and press. Annual publication of the Campsfield Monitor newsletter. Working with local Asylum Welcome and Bail for Immigration Detainees staff and volunteers. Helping to set up Bicester Refugee Support and Campaign Against Bullingdon Immigration Removal Centre. 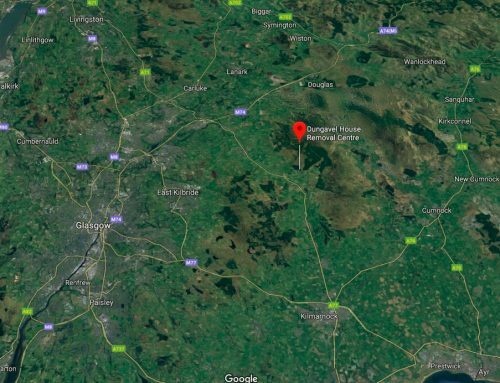 Individual and collective actions have included people climbing in to Campsfield and squatting on the roof, lying down to block vehicles, establishing Human Rights Camps outside the gates, and a well-publicised attempt to dig an escape tunnel from the outside. Setting up the Network Against Detention (1994) and Barbed Wire Britain network (2001), and helping to set up the Detention Forum. Marching to London to deliver petition for closure (1994). Raising issue in trade unions locally and nationally, securing support of 6 national unions for end to detention. Lobbying meetings with MPs at the House of Commons. Helping to set up Yarl’s Wood 13 and Harmondsworth 4 defence campaigns. Setting up the Bail Observation Project, which has published reports including Immigration Bail Hearings: A Travesty of Justice? (2011) and Still a Travesty (2013). 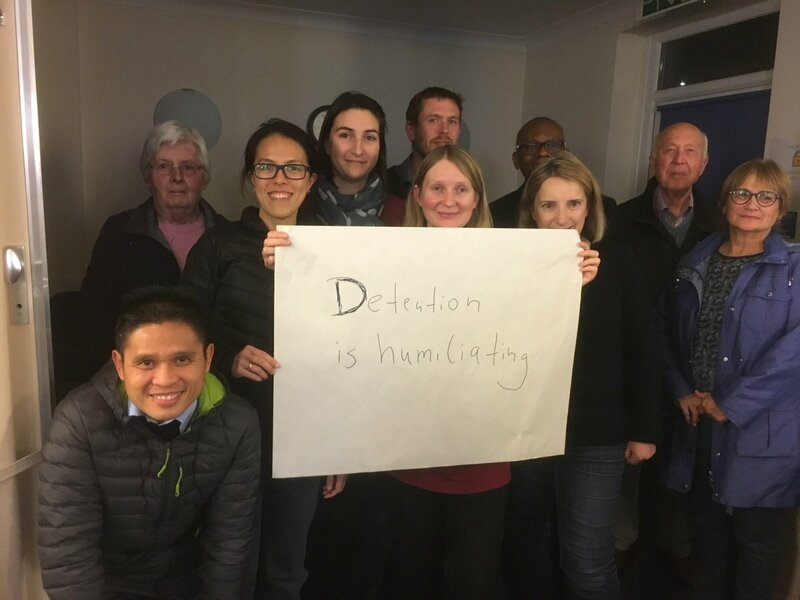 Helping to establish local anti-detention campaigns at other detention centres. 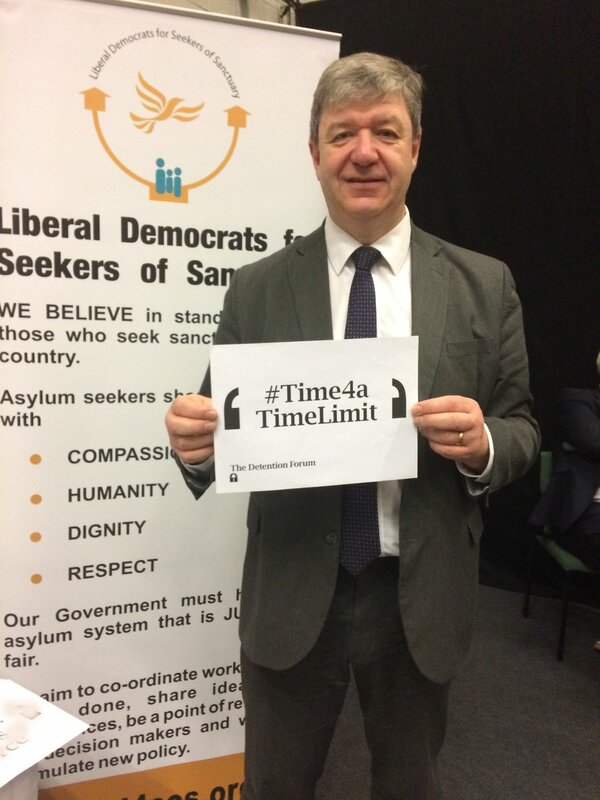 Sending representatives to conferences such as the European Social Forum, and actions such as No Borders camps. 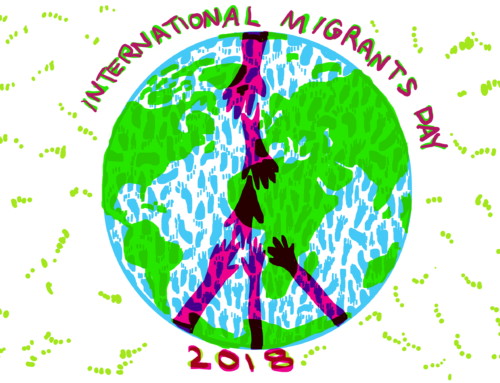 Helping to initiate international days of action for migrants’ rights. Working with the Platform for International Cooperation on Undocumented Migrants (PICUM) to raise the issue of immigration detention. Establishing links with campaigns in other countries and with MEPs. Organising a conference on immigration detention in Europe (2000). Submitting evidence to national and international parliamentary and human rights bodies. 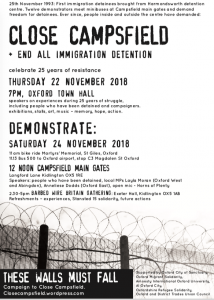 At 7pm Thursday 22 November at Oxford Town Hall, we shall celebrate 25 years of resistance. People who have been detained and campaigners will speak about their experiences over 25 years of struggle. There will be exhibitions and stalls addressing memory, hope and action. We have already received messages from a variety of campaigners over the years. Then at 12 noon on Saturday 24 November at Campsfield, we shall demonstrate determination to continue the struggle against immigration detention. Speakers will include people who have been detained, and local MPs Layla Moran (Oxford West and Abingdon) and Anneliese Dodds (Oxford East). You can find more information on our flyer. The same day, from 2.30-5pm, there will be an anti-detention Barbed Wire Britain gathering at Exeter Hall Kidlington OX5 1AB with refreshments.